When the cold fronts come to Florida in winter the sailfishing along Florida’s Gold Coast can be incredible! This year during the 54th Annual Buccaneer Cup Tournament, it was without a doubt slower than usual. But the team aboard the 58-foot Paul Mann LO QUE SEA have some proven successful methods and they love to fish and win against the very best no matter the conditions! They did it again! Huge congratulations to Owner Tony Huerta, Captain Kevin Paul and Mate Lenny Schlin as well as Wallace Higenbothem, all team members aboard during the two days of fishing at the legendary Buccaneer Cup Sailfishing Tournament out of Sailfish Marin. 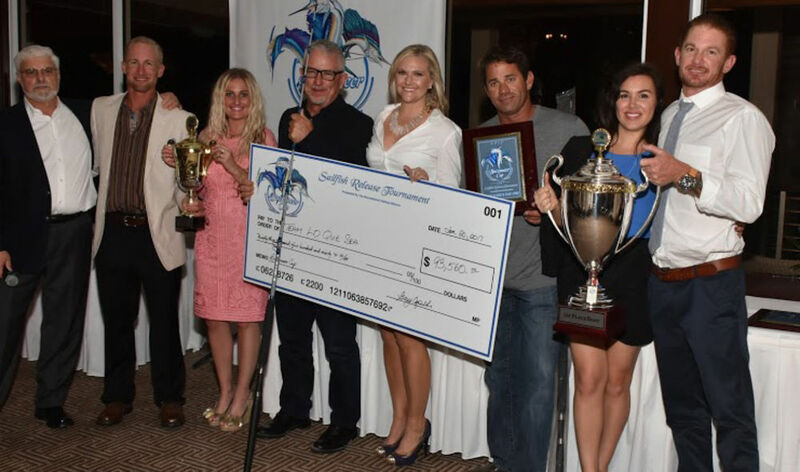 LO QUO SEA’s sailfish releases came to a total of 1200 points more than good enough for the win and a check for over $90,000! Pretty work guys!! Twenty-six of the world’s best teams in our sport took part in this longstanding and prestigious event. Again, thanks to all the participants for starting the years with another great event and especially congratulations again to the owner and crew aboard LO QUE SEA for a very impressive win!